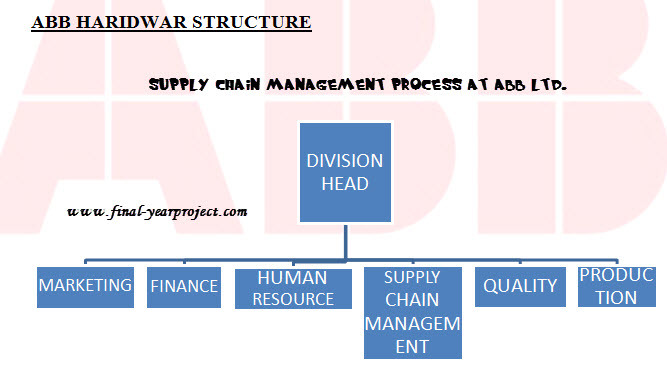 This is management project work on supply chain management process carried out at ABB Ltd. The main focus of this ABB business is to provide customers with products and solutions for instrumentation, automation and optimization of industrial process. The scope of study will include understanding the procurement system activities that takes place in the organization i.e. procurement of materials and services. The project will also study the various stages of the procurement process i.e. (Purchase process and negotiations etc). You can also Subscribe to FINAL YEAR PROJECT'S by Email for more such projects and seminar. This summer project is taken at Haridwar plant of ABB which is a subunit of ABB India Pvt Ltd. In Haridwar plant ABB is basically into the manufacturing of Miniature circuit breaker (MCB). The objective of this project are to understand the supply chain management process of ABB and the project will also include the detailed study of the effectiveness of the SCM process of ABB. Use this report for your reference and study work only.